for the 2003-2004 program year. This does not include all events and activities. Notification will be sent regarding any date changes. his event all week long! of service during Girl Scout Week. Girl Scout Sunday and Girl Scout Sabbath (Saturday) was a time girls attended services at their house of worship. Monday was designated Homemaking Day. Wednesday was Health and Safety Day. Friday was Girl Scout Birthday, as well as Arts and Crafts Day. April 22 is Girl Scout Leader Appreciation Day. Most Girl Scout leaders are volunteers. They donate several hours of their time each week to do activities with groups of girls. They take training to learn about the Girl Scout program. They meet with other leaders to plan events for troops in the area. World Thinking Day celebrations and activities can take many forms. Thinking Day will be 78 years old this year. The idea for a special day each year on which Girl Guides/Girl Scouts around the world think of each other began at the 4th International Conference held in the USA in 1926.
the birthday shared by the Founder, Lord Baden-Powell, and the World Chief Guide, Olave, Lady Baden-Powell. The Thinking Day Fund began at the 7th World Conference held in Poland in 1932. A delegate from Belgium suggested that since birthdays usually meant presents — all Girl Guides/Girl Scouts could offer a voluntary contribution along with their thoughts on Thinking Day as a way of showing appreciation and friendship . The suggestion caught on quickly and the Thinking Day Fund was established for the promotion of Girl Guiding/Girl Scouting wherever the need was greatest. clicking on the Thinking Symbol. A Thinking Day symbol was introduced in 1975. 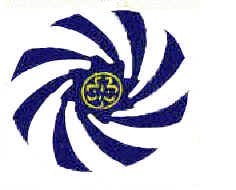 The World Trefoil in the center represents the World Association. of the Girl Guide/Girl Scout Movement.